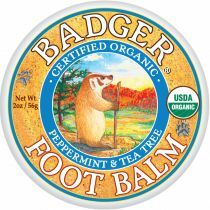 A favorite of athletes, Badger Balm Cooling Muscle Rub eases aching muscles with Camphor, Cajeput and Clove. Massage into shoulders, knees, elbows, your lower back, anywhere that feels sore. Use to soothe the everyday aches and pains resulting from exercise and hard work. Now USDA Certified Organic! 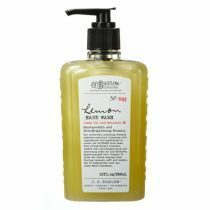 Sore Muscle Rub Cooling Blend - oriental style - with the big three "C's": Camphor, Cajeput and Clove, to penetrate and soothe. Add Peppermint & Eucalyptus - and you've got the makings of a spectacular cooling pain soother and muscle calmer that's a great support for deep breathing as well. This type of penetrating herbal formula has been a favorite of athletes and martial artists for centuries. 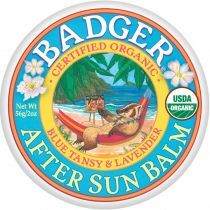 Cooling Blend completes the Badger line of Muscle Rubs - allowing athletes to maintain a competitive edge without petroleum or petroleum byproducts, preservatives, or chemicals of any kind. 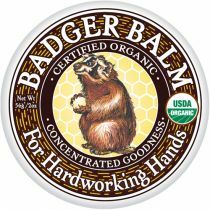 Badger Balm Cooling Muscle Rub eases aching muscles with "the three big C's" : Camphor, Cajeput and Clove. *◊Olea Europaea (Olive) Fruit Oil, *Cera Alba (Beeswax), *Ricinus Communis (Castor) Seed Oil, *Menthol, *Eugenia Caryphyllus (Clove) Bud Oil, *Eucalyptus Globulus (Eucalyptus) Leaf Oil, *Eucalyptus Staigeriana (Eucalyptus) Leaf Oil, *Cinnamomum Camphora (Ravintsara) Leaf Oil, *Mentha Piperita (Peppermint) Leaf Oil, and *Melaleuca Cajaputi (Cajeput) Leaf Oil.